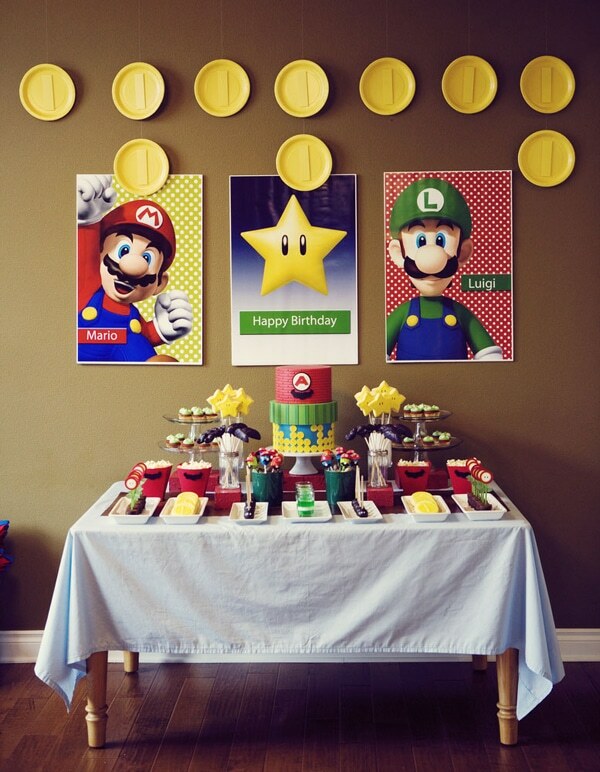 Power up your Super Mario Party with the help of these creative birthday party ideas! 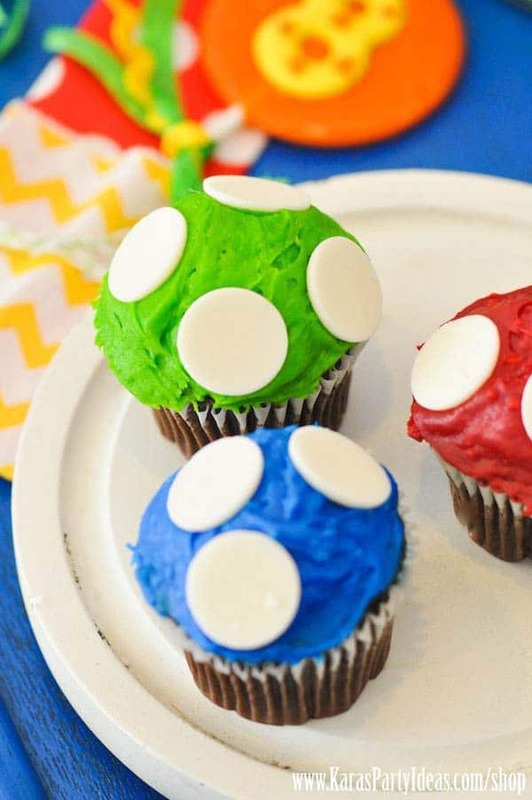 If your little one is ready for an awesome birthday adventure with pals Mario and Luigi in the Mushroom Kingdom, then these 19 Awesome Super Mario Birthday Party Ideas will help you bring the video game to life for a one-of-a-kind birthday celebration! Score some major points with the kids and these ideas for decorations, cupcakes, cakes, food, party favors, games, and more! Your little gamer will be so impressed! Since Super Mario Brothers is based on a video game, a Super Mario Party definitely needs some fun party games, right?! 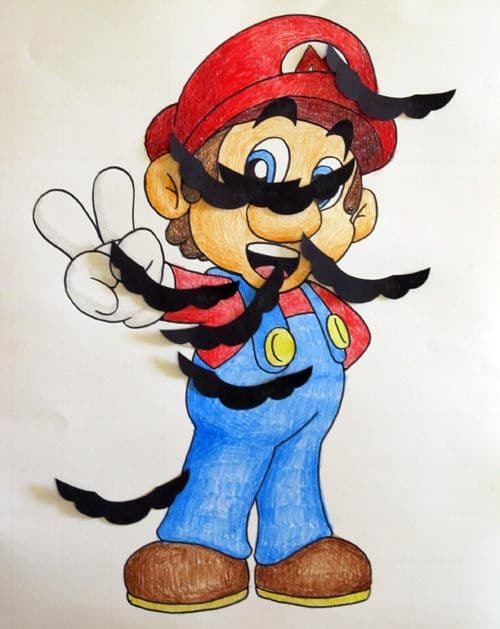 Make this fun DIY Pin the Mustache on Mario Game to keep the kids busy and having fun! The first thing you need after determining your Super Mario Party Theme is a super cool party invitation that will get the kids excited for the party! 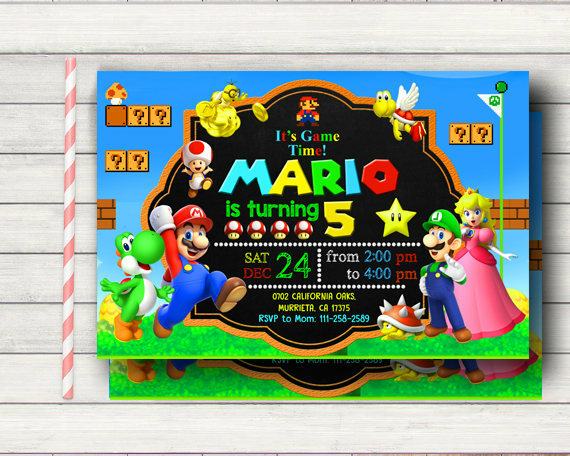 Set the tone for the celebration with this Super Mario Party Invitation! Every kid is excited to get cool party favors, but when they see these awesome Super Mario Party Favor Boxes they are going to go crazy! 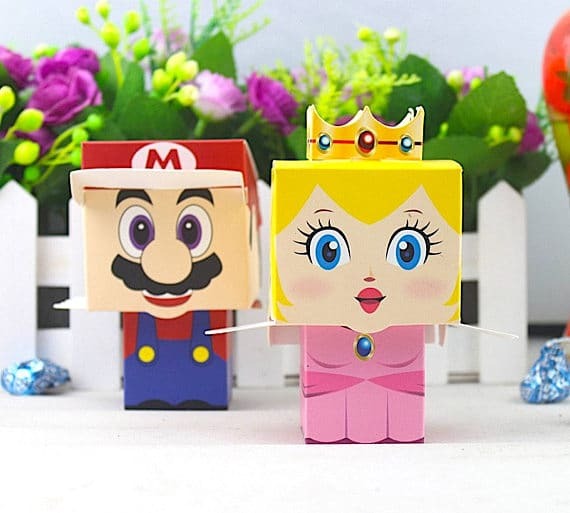 Seriously, how perfect are these favor boxes for a Super Mario Birthday Party?! Just fill them up with themed toys and candy and you will have yourself some happy kids! Bring the Super Mario game to life with these awesome Super Mario Party Cutout Decorations! Imagine how awesome your party space will look with these giant characters! The kids will have a blast taking photos next to their favorites! The theme doesn’t stop at the party favors! 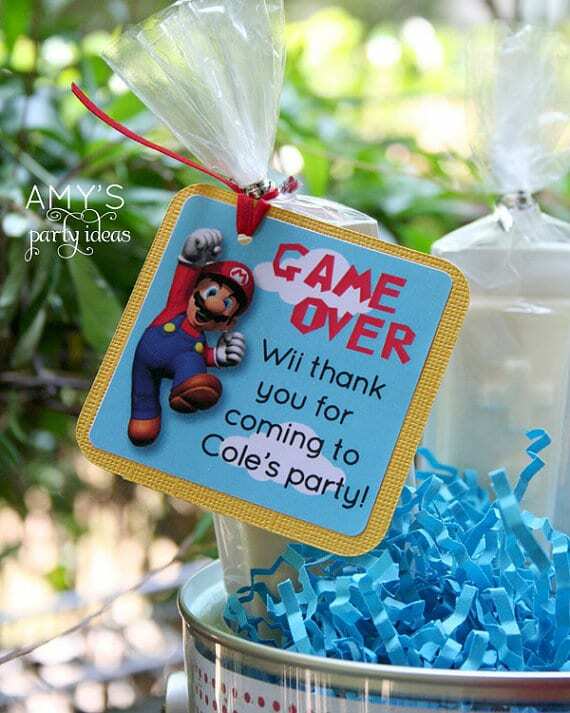 “Game over!” How cute and clever are these Super Mario Party Favor Tags?! Attach these creative favor tags to your party favors for the best take home. token a kid could get! It’s time to start thinking about how you are going to incorporate the food and desserts into the Super Mario Party theme. These Mushroom Cupcakes are quick and easy to whip up and the party guests will love them! Is this Super Mario Party Backdrop AMAZING or what?! 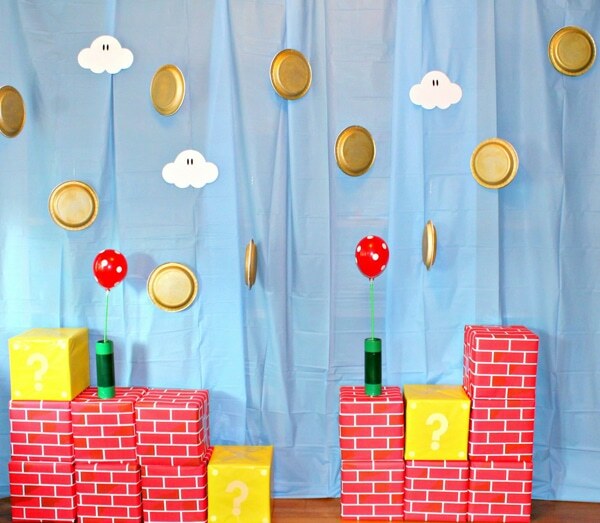 The kids will have a blast taking photos in front of this backdrop that looks straight out of the video game! 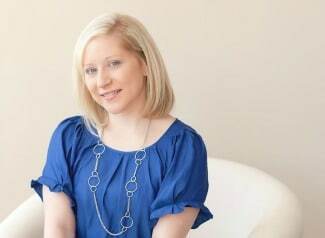 All you need to create this backdrop are some gold plates, boxes, red brick paper, yellow paper, white paper, and a blue sheet. It’s time to start crafting the party decorations! This Super Mario Party Set Up is pretty awesome as well. We love how creative parents get for their children’s parties! It looks like you stepped right into the screen to play the game! 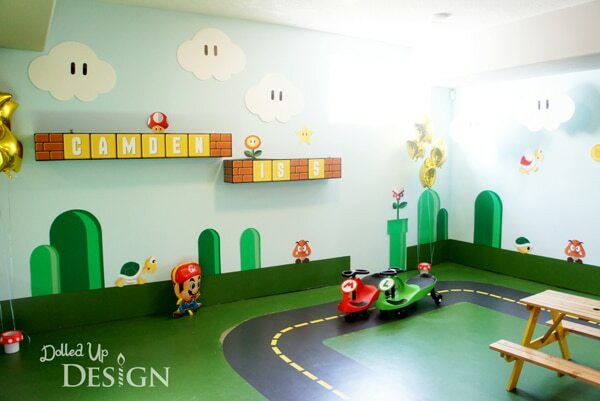 What a great Super Mario Party room! 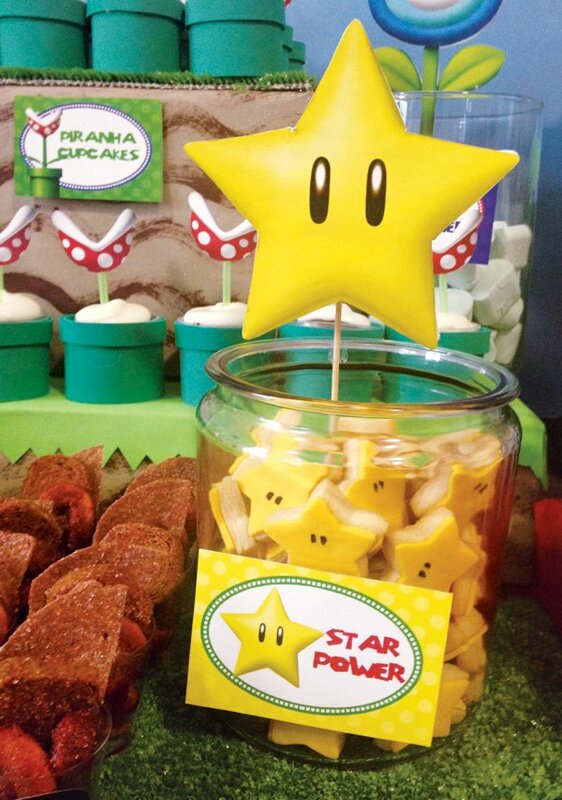 These Star Power Cookies are a great added detail to your Super Mario dessert table! They are super easy to make and with an added food label they fit the theme perfectly. 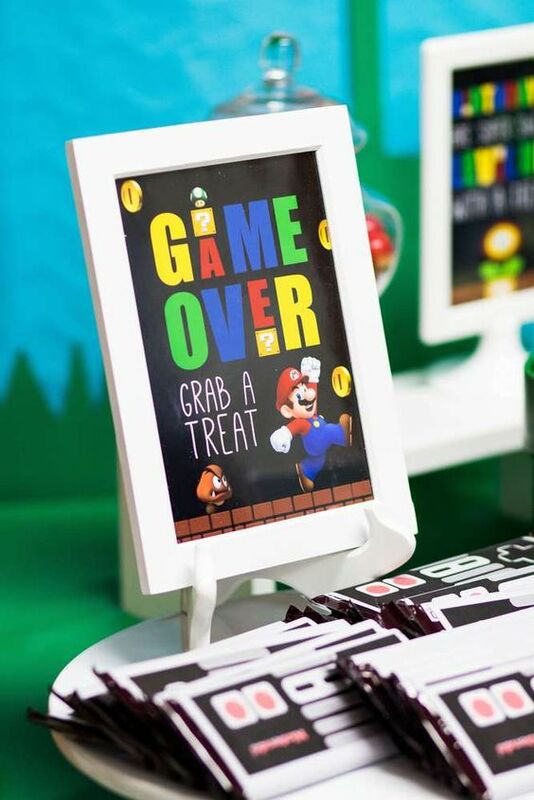 How clever is this Game Over Treats Sign and Nintendo candy bar wrappers for a Super Mario Birthday Party?! What a great party favor idea with the theme perfectly executed. The kids will love these fun Super Mario Party Ideas! This cool Super Mario Dessert Table features gold coins and Mario and Luigi photos for the backdrop. 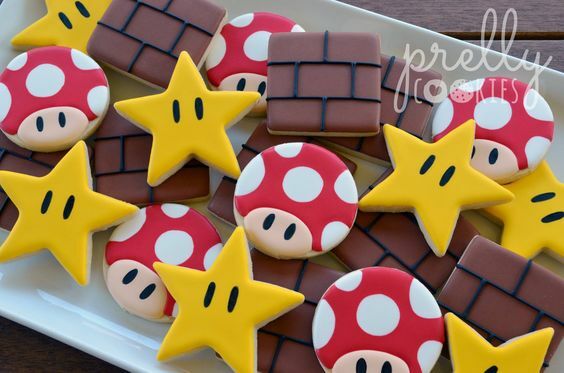 These Super Mario Cookies are a must-have for this party theme! Need a fun cake idea for the party?! 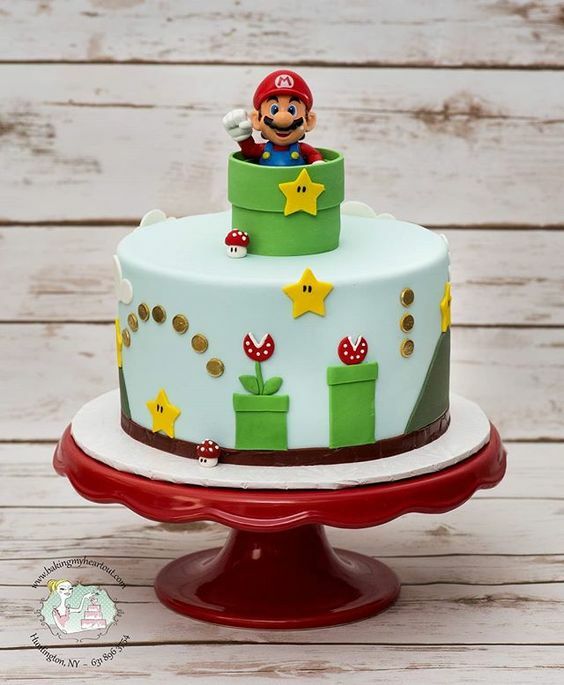 This Super Mario Cake is perfect! 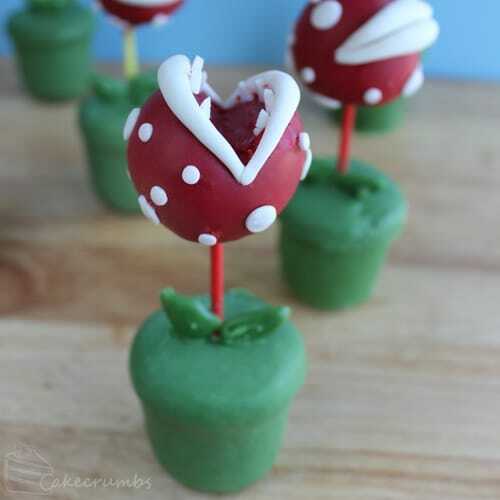 Add these Piranha Plant Cake Pops to your sweets table. 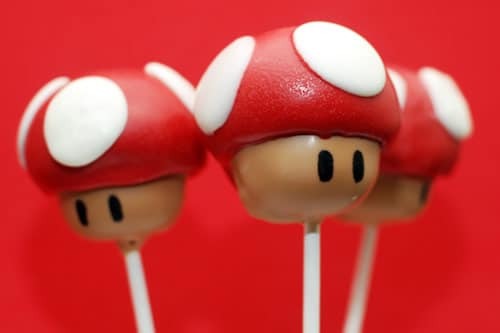 How cute are these Mario Mushroom Cake Pops?! These Super Mario Party Desserts are picture-perfect! 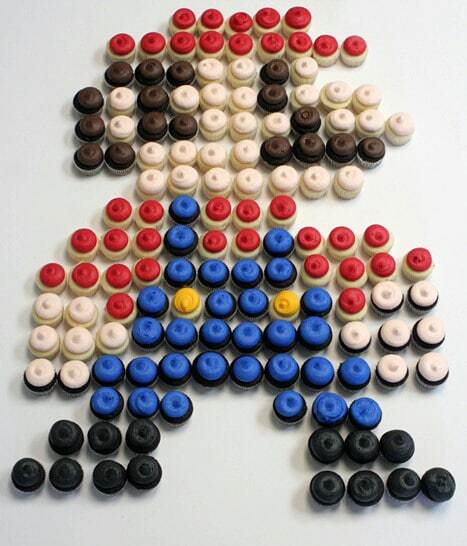 Everyone at your party will LOVE these Mario Cupcakes shaped to look like Mario! How cool! 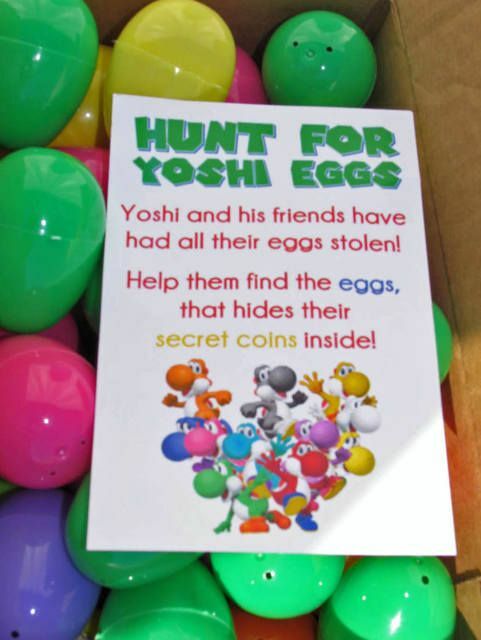 Another fun activity for the kids to do at the party is this Hunt For Yoshi Eggs Game. 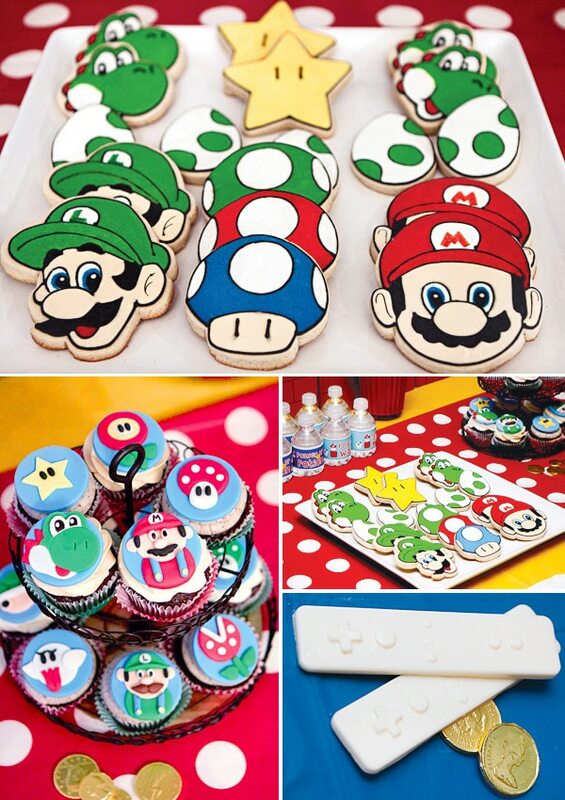 Which of these 19 Awesome Super Mario Birthday Party Ideas are your favorites? Let us know in the comments below!